Snowmobilers are enjoying what Mother Nature has delivered to Iowa this winter. But, conservation officers with the Department of Natural Resources are finding quite a few of those snowmobilers are driving drunk. The D.N.R. arrested 10 snowmobile operators for O.W.I. over the last two weekends in north-central and northeast Iowa. Ken Lonneman, a conservation officer in Clear Lake, says the enforcement projects involved the D.N.R. and the Iowa State Patrol. "They provided an airplane and called us to where the biggest snowmobile activity was…it just makes it more time efficient for us," Lonneman said. Several snowmobilers were also cited for not having registration and failing to stop at an intersection. But, Lonneman says he was surprised with the 10 drunk driving arrests. "We don’t mean to paint all snowmobilers with the same brush, but on the other hand, there are certain groups of snowmobilers that we are targeting on these evening patrols and they have to abide by the same drinking and driving laws that motor vehicle operators have to abide by," Lonneman said. 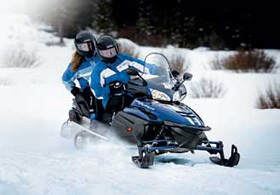 Snowmobilers, like motorists on the road, are considered "drunk" if their blood-alcohol level is .08 or more. "What was most shocking about our operation was some of these snowmobile operators were two or three times over the legal limit," Lonneman said. "It wasn’t like they were just a little over, they were way over (the legal limit)." Despite the heavy snow cover this winter, there have not been any reports of any serious crashes or fatalities involving snowmobiles in Iowa. There are 28,000 snowmobiles registered in the state.